Editorial: What is your photo style? Waki, Tomonori / Kan, Joseph Y. K.
Immediate implant placement and provisionalization in the esthetic zone have been documented with success. The benefit of immediate implant placement and provisionalization is the preservation of papillary mucosa. However, in cases with osseous defects presenting on the facial bony plate, immediate implant placement procedures have resulted in facial gingival recession. Subepithelial connective tissue grafts for immediate implant placement and provisionalization procedures have been reported with a good esthetic outcome. Biotype conversion around implants with subepithe- lial connective tissue grafts have been advocated, and the resulting tissues appear to be more resistant to recession. The dimensions of peri-implant mucosa in a thick biotype were significantly greater than in a thin biotype. Connective tissue graft with coronally positioned flap procedures on natural teeth has also been documented with success. 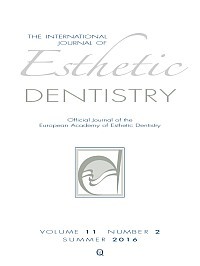 This article describes a technique combining immediate implant placement, provisionalization, guided bone regeneration (GBR), connective tissue graft, and a coronally positioned flap in order to achieve more stable peri-implant tissue in facial osseous defect situations. Anterior teeth are often affected by accidental dental trauma and may eventually be lost. When the neighboring teeth are unharmed, implant-supported crowns are often the preferred treatment choice. When not only the teeth but also the supporting hard and soft tissue has been lost, surgical reconstruction may be needed. However, in combined horizontal and vertical class III defects, the INTERNAT IONAL available augmentation techniques are often not predictable. In this case report, two neighboring mandibular central incisors were replaced by two implants after soft and hard tissue augmentation with the cortical bone plate method. The interdental soft tissue was reconstructed with remarkable success, making this an example of what can be achieved in cases such as this. Objectives: The objectives of this in vitro study were: 1) to test the agreement among color coordinate differences and total color difference (ΔL*, ΔC*, Δh°, and ΔE) measurements obtained by digital image analysis (DIA) and spectrophotometer, and 2) to test the reliability of each method for obtaining color differences. Materials and methods: A digital camera was used to record standardized images of each of the 15 shade tabs from the IPS e.max shade guide placed edge-to-edge in a phantom head with a reference shade tab. The images were analyzed using image-editing software (Adobe Photoshop) to obtain the color differences between the middle area of each test shade tab and the corresponding area of the reference tab. The color differences for the same shade tab areas were also measured using a spectrophotometer. To assess the reliability, measurements for the 15 shade tabs were repeated twice using the two methods. The Intraclass Correlation Coefficient (ICC) and the Dahlberg index were used to calculate agreement and reliability. Results: The total agreement of the two methods for measuring ΔL*, ΔC*, Δh°, and ΔE, according to the ICC, exceeded 0.82. The Dahlberg indices for ΔL* and ΔE were 2.18 and 2.98, respectively. For the reliability calculation, the ICCs for the DIA and the spectrophotometer ΔE were 0.91 and 0.94, respectively. Conclusions: High agreement was obtained between the DIA and spectrophotometer results for the ΔL*, ΔC*, Δh°, and ΔE measurements. Further, the reliability of the measurements for the spectrophotometer was slightly higher than the reliability of all measurements in the DIA. Objective: The aim of this in vitro study was to investigate the color changes of human teeth caused by five different diffuser materials commonly used in dental photography, as well as software influence, and to confirm whether the use of a standardized gray reference card is effective in correcting these color changes during digital postproduction. Materials and method: Forty extracted human teeth were obtained from a specialized oral surgery practice in Cham, Germany. Five commonly used diffuser materials were chosen to be investigated, which included: polyethylene (PET), White Frost photographic paper, LumiQuest polyamide (nylon) material, 80 gsm white printing paper, and 3M linear polarizing filter sheet used for cross polarization. A digital single-lens reflex camera (Canon EOS 5D MKII) was used, together with a twin flash suitable for macrophotography (Canon MT-24EX Macro Twin Lite). Images were tethered into Adobe Lightroom CC using the RAW format. A standardized gray reference card (WhiBal, Michael Tapes Design) was used for exposure calibration and white balancing. Classic Color Me- ter software (Ricci Adams, version 1.6 (122)) was used to obtain CIE L*a*b* values of the specimens before and after white balancing and exposure correction. Results: All diffusers caused visually perceivable color changes on the extracted teeth: White Frost (ΔE* 1.24; sd 0.47), 80 gsm printing paper (ΔE* 2.94; sd 0.35), LumiQuest polyamide (ΔE* 3.68; sd 0.54), PET (ΔE* 6.55; sd 0.41), and 3M linear polarizing filter sheet (ΔE* 7.58; sd 1.00). The use of a standardized gray reference card (WhiBal) could correct these values below the visually perceivable threshold: White Frost (ΔE* 0.58; sd 0.36), 80 gsm printing paper (ΔE* 0.93; sd 0.54), LumiQuest polyamide (ΔE* 0.66; sd 0.58), PET (ΔE* 0.59; sd 0.33), and 3M linear polarizing filter sheet (ΔE* 0.53; sd 0.42). Significance: The use of a standardized gray reference card with specified CIE L*a*b* values should be considered when diffusers are used in dental photography in order to reveal the color of preoperative situations (ie, shade documentation) and document postoperative results accurately.